Have you ever had one of those days when everything seems to be on a theme or running on a script? Sometimes the script is from a bad movie, but usually it involves the repetition of a certain word or subject – such as hot dogs or German adverbs – or a sequence of events involving dead phones, computer glitches, and failing cameras. 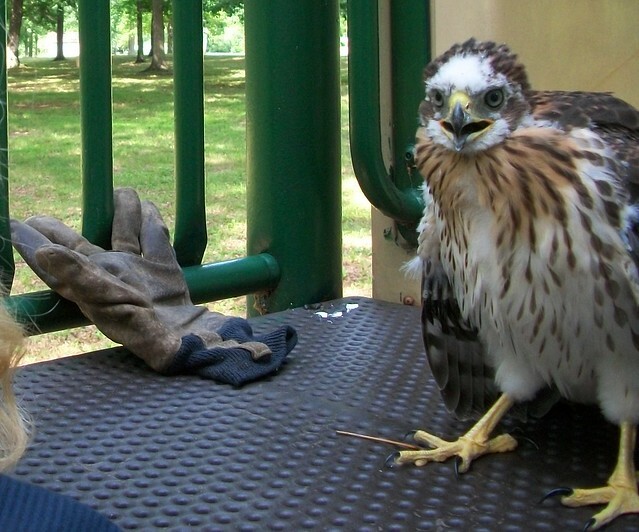 Well, I had a Cooper’s Hawk day last week and I’m going to tell you about it. None of the following actually happened to me but they were all related to me on the same day. As a naturalist, people tell me things and ask questions and this is the reason I became the common factor on this issue. Granted, I realize this particular thing is probably a naturalist specific event and might need some explaining. Cooper’s Hawks are medium sized, long-tailed, members of the Accipiter group of hawks. They are bird-eating hawks which specialize in plucking house finches and doves from feeders and rendering them into piles of feathers and blood. They nest on stick platforms constructed high up in the branches of woodland or parkland trees and can be very aggressive when it comes to nest defense. There, I think that does it. We can now proceed without any further explanation to case no. 1. A museum patron named Linda walked in the door and leaned over the counter. She had a camera in hand. By the curl of her eyebrows I knew that she had an identification question relating to a picture on that camera (you could say I’ve seen this before). 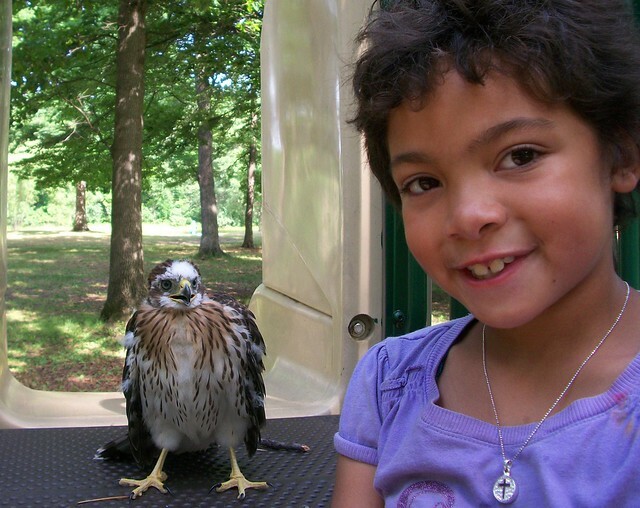 She proceeded to show me a photo of a young hawk sitting next to a little girl and told me that they encountered the bird in the play area at Willow Metropark. I told her that it was probably a young Cooper’s Hawk and she went on to explain that there was a large nest in the tree above this spot. The family was at their annual reunion in the picnic area when Jessica, Linda’s niece, walked over to her and started to tell her about her new friend. Jessica said something to the effect that her aunt needn’t worry because her friend wouldn’t hurt her. This, of course, caught Linda’s interest and she asked to see this person. “Her name is Rebecca,” spouted Jessica and she led her over to the slide. There on the top platform was a rather befuddled looking young Cooper’s Hawk. It had a hefty covering of down but was in the process of molting into sub-adult feathering – resulting in a male pattern baldness appearance. Like a puppy, it was obviously destined to grow into its feet! The pictures will do better than words for this part of the story (although I can’t explain the heavy glove in the shot). Jessica and her aunt talked it over and decided to let Rebecca…er, the bird… stay where it was. Jessica was worried that a “Park Ranger” might put it into a cage and take it away (those bad old park rangers). They both said a little prayer for the bird and walked off. As a parting gift, the niece left a few of the prizes she had won in some of the earlier games on the slide platform with Rebecca. Eventually the hawklet flew off the slide and sauntered off into the woods and all were happy. Lucky for Jessica and Linda, the parent birds were not in the immediate vicinity of Becky the Coop. This story may not have ended so delightfully if they had. Shortly after this delightful story was told to me, I received a call which went about as follows. 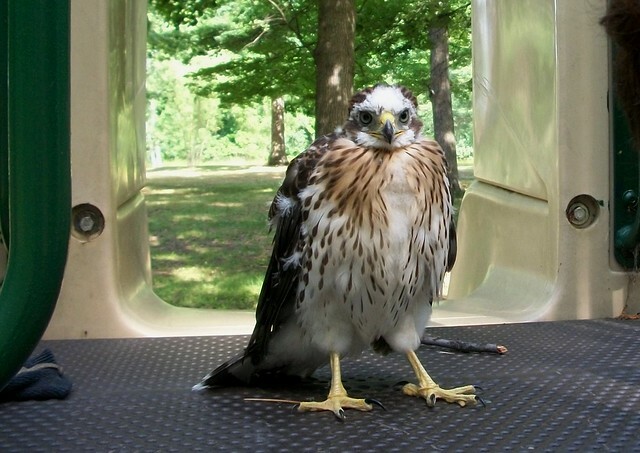 A lady reported a baby hawk of some sort in Memorial Park in Lincoln Park (next to the John Wilkes Toll Booth – just kidding). It had a white chest with “tannish streaks” on it, a longer tail with bands on it, and was about 12 inches tall. You, the reader, need only to look at the pictures of Rebecca to make your judgment as to what was being described. This gal had been watching the nest from a distance for some time now and needed to settle an argument with a friend who said it was a Peregrine falcon family. She thought it was a Cooper’s Hawk. Sight unseen, I was able to confirm that her friend was a stupid idiot because our local Peregrines nest on the sides of buildings and not in tree nests. In order to separate it from a possible Red-tailed Hawk nest I asked what kind of prey the adults had been bringing to the nest. “Birds, “she said, “it was bringing birds to the nest and plucking them into pieces for the young.” Yes, it was a Coopers Hawk or else I am a stupid idiot. NOTE: ALL PICTURES IN THIS EDITION OF NATURESPEAK WERE TAKEN BY LINDA GAWLIK AND USED WITH HER PERMISSION (there was no permission from Rebecca). 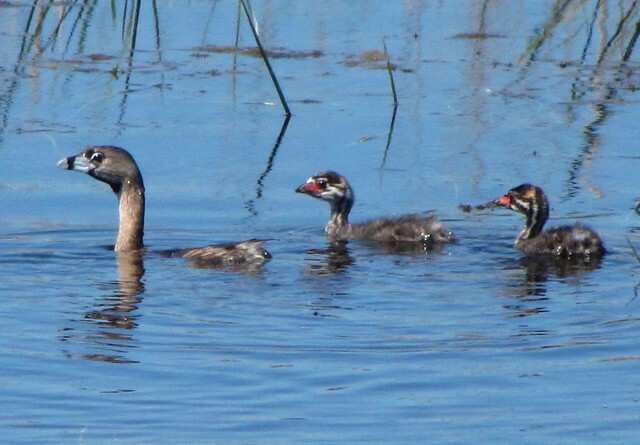 I’m not sure why, but Pied-billed Grebes are often referred to as “Hell Divers.” They don’t look especially nasty and they live in cool water, so the whole idea is rather lame. Technically, they don’t even dive. It makes for a good title, however. When you add the word Hell to anything it adds immediate interest (Hell children, for instance, are more fascinating than just children). 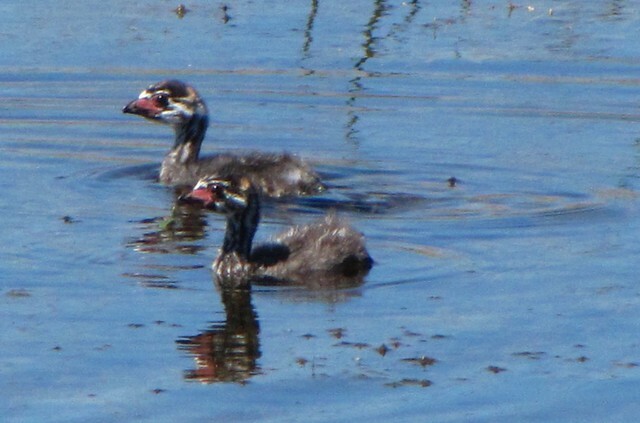 Grebe children – aka baby grebes – should be called “Hellians” if we stick to this formula, but they really look and act more like confused little stripy chicks. I came up several sets of confused little stripy Grebe chicks at Pointe Mouillee recently and was lucky enough to digitally bag a set – along with their mom. The attending adult in this case displayed the usual traits of the species. The adult birds (both male and female) look alike in their plainness. Both are chunky chicken-like birds with a light coffee-with-cream brown complexion. They have long necks and virtually no tail (this part being reduced to a pathetic tuft of feathers). During the breeding (hell season) they have a black chin beard and a light blue bill circled with a dark band. 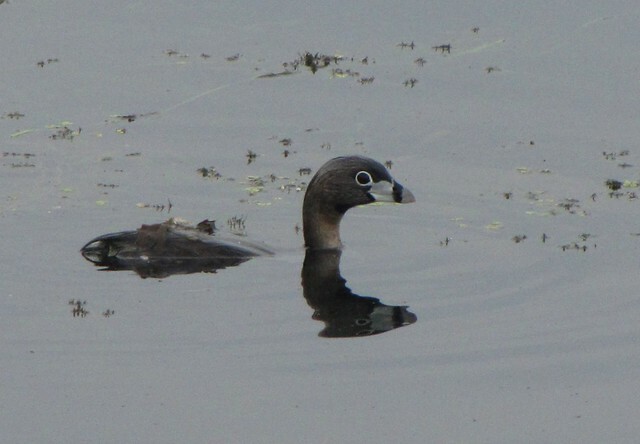 This bill feature is the reason behind their common name of Pied-billed Grebe. “Pied” refers to the two color bill. Although “Pie-bill” would be easier to say and write, the name is “Pied-billed” and that is that (hell of a name, eh?). It is useful to think of them as “Pie-bills” in an odd sort of way because their bill is wedge, or pie, shaped. Theirs is a beak more akin to that of a chicken. It is a beak used for feeding on fish, crayfish, and aquatic insects. 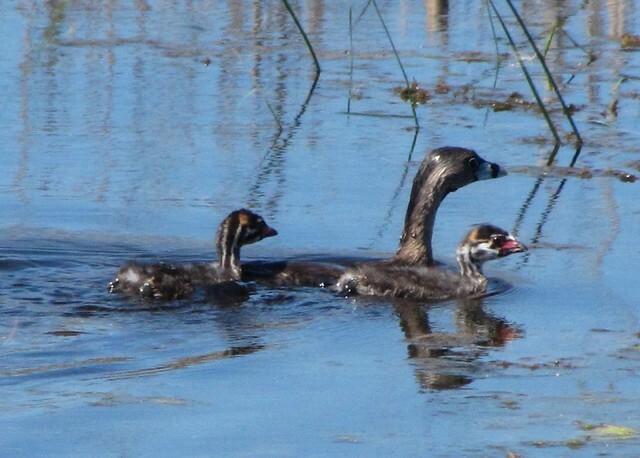 Young grebes do not look like their parents at all. They are marked with a wonderful array of dark and light stripes and a red face patch. This patterning probably serves to camouflage their outlines when among cat-tail and reed stems. 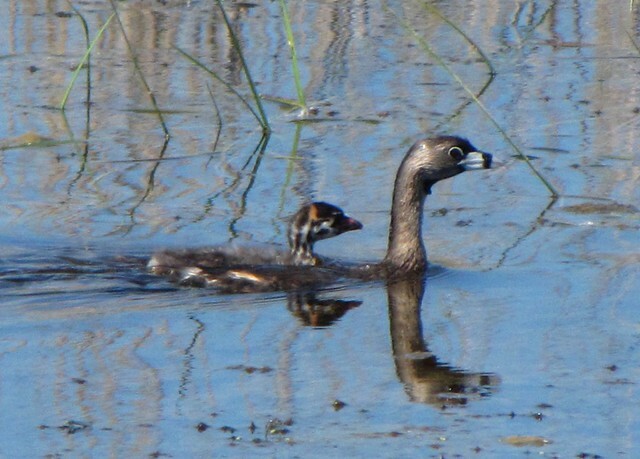 Born atop floating mats of vegetation, the chicks leave their nest immediately upon hatching but do everything they can to stay out of the water – including riding mom’s back whenever possible. I can say with some small bit of authority that they are slow to develop their diving abilities. The chicks pictured here were obviously alarmed by my presence (note the “what the hell! ?” look). Instead of doing the usual Grebe thing, which I will explain in a moment, they swam around in circles. It soon became apparent why they didn’t dash for the cover of the nearby cat-tails when mom bobbed to the surface. She had ducked out of sight when I arrived and they were waiting for further instruction. Grebes are champion submerged swimmers. Once they get a handle on their technique they can swim great distances under water. Instead of actually diving, they simple submerge in the manner of a submarine. When they go down the last thing remaining above the water is their head (as opposed to other avian divers which leave you with a view of their hind end as they descend). Here are a few pictures (below & here) of another adult grebe in the process of sinking. This behavior is a great identifying feature when you see one of these small marsh chickens disappear from a distance. In order to submerge, Pied –billed Grebes are able to adjust their buoyancy by compressing their feathers. Already possessed of rather dense bones, they can choose their sinking depth by forcing air out from beneath their feathers. Often they submerge to the point where just their heads remain peering out and they will swim for a while in this position. Otherwise, they will sink and swim. Unfortunately, the little hellions in these pictures were unwilling, or unable, to follow their mother’s lead when she initially sunk out of sight. They milled about until she returned to guide them to cover via the surface route. No doubt the family engaged in some submarine practice after I left. So, the next time I see them I won’t see them (what in the hell did I just say?). Ahh, That’s Why it’s Called a Cat-tail! unless you’ve seen one in June. So, you get our drift. Fortunately, we are here to help. 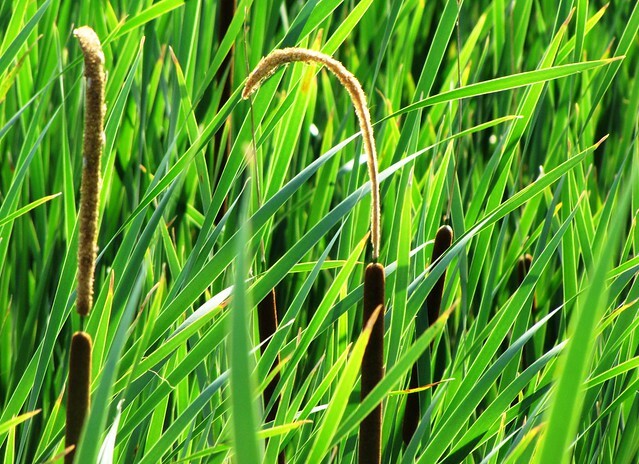 The next time you show Timmy a Cat-tail plant you can tell him that it is called a Cat-tail because during a brief two week period in early summer the plant produces a flower that really does look like a cat’s tail. Not to confuse the issue, but during this brief time there are two “corn dogs” on each plant. The top one is the male flower and the bottom one is the female flower. The male flower eventually produces a cloud of pollen, withers, and then falls off. This leaves the female flower to develop into that “corn dog-like” structure full of fluff and seeds. That special flowering time of year is right now. 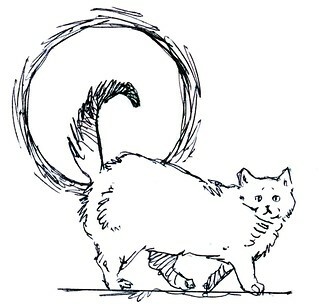 Take Timmy out and show him a cat-tail plant and point out the cat’s tail curling off the top. This will end years of potential confusion and the telling of small white lies. People never ate cats and old-time people weren’t any smarter or dumber than we are now. 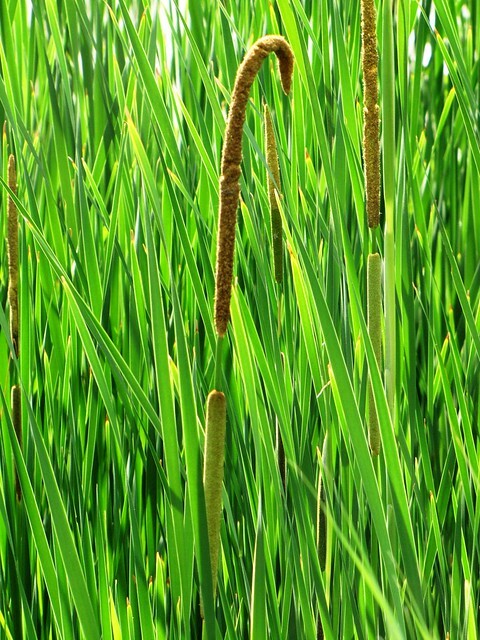 If you wish, you can mention that these plants were also known as Cooper’s Reed (used by barrel makers to wedge into cracks), Reed Mace (for another reason that is far too complicated to get into now) and even Bulrush (meaning big water plant). Unfortunately most of these fancy names are European in origin and they only make sense in Europe, so we are pretty much stuck with Cat-tail. It’s that time of year again – early June when the local White-tailed Deer bear their fawns. In usual parlance, it is said that the Does “drop” their fawns. Although this may sound rather drastic and random it simply means that they place their delicate cargo in the tall weeds and leave them there for an extended time. In the original plan, that is according to the Ancient and Venerable Book of Instinct (a mental text hard-wired into the biological I-Pad of all creatures), the newborn deer is supposed to stay put while mom while mom deer is away. Since newborns don’t have any body scent, they are safe from the probing nose of predators. But, not all fawns have an equal understanding of this instinctual text. 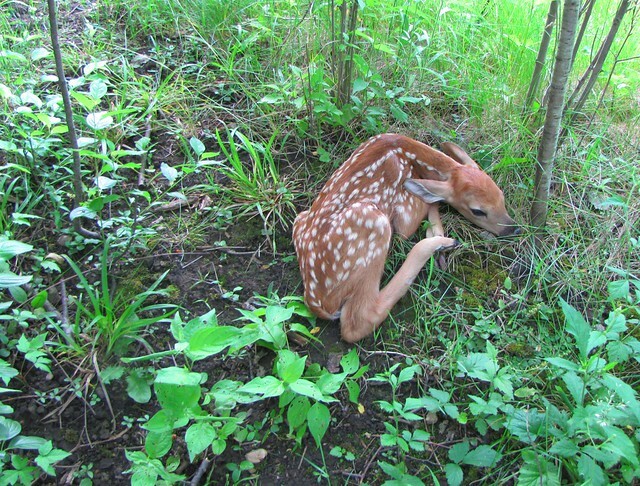 One such non-compliant fawn was found wandering across the road just north of Lake Erie Metropark. It was a brand new deer with a small portion of the umbilical cord still attached. When one of the park police, Officer Kathy to be precise, came upon the critter she attempted to shuttle it off the road. Unfortunately, the fawn decided to selectively recall another passage of instinctual protocol and immediately dropped into a freeze position right there on the edge of the road. Not sure exactly what to do, and fearing it might be hurt in some way, our officer piled the motionless deer into the passenger seat and took it for a ride to the museum. Freezing is a hard-wired response employed by many little ungulates (hooved ones). Technically it is termed “alarm bradycardia” and physically it looks like the creature has fallen into a coma. During this reaction, the heart-rate goes down by a third and the creature is spared a nervous breakdown. This “stop and drop” reaction removes the burden of thinking for small mindless beings that have no worldly experience. Until they know better and can run better (in about a week), all things are potential threats. It is best to drop before actually being seen, but that is a fine detail which natural selection usually irons out. 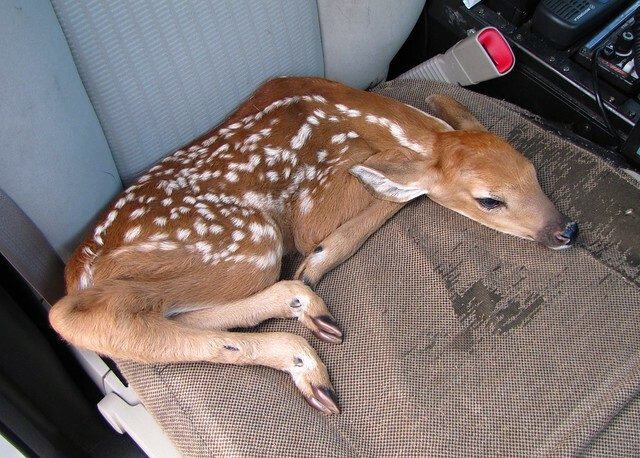 When the fawn arrived at the museum it was passively laying on the seat like some guilty shoplifter. 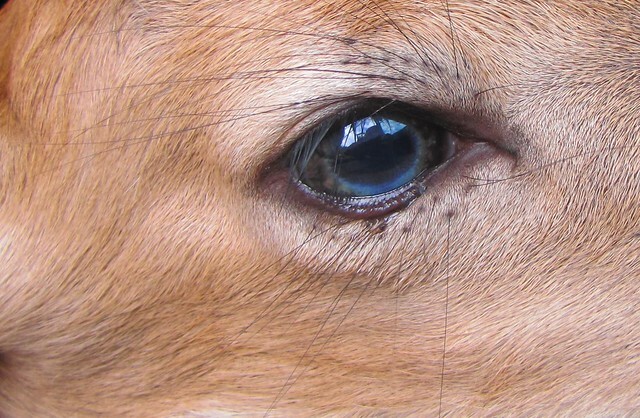 Although its eyes were open it was completely unresponsive and allowed for a complete examination. Following the details of the instinct handbook to the letter, this deer was not going to move even if we chose to play volleyball with it (using it as the ball, of course). Even though I do not like deer, I have to admit that little deer (like little cats) are tolerably handsome. 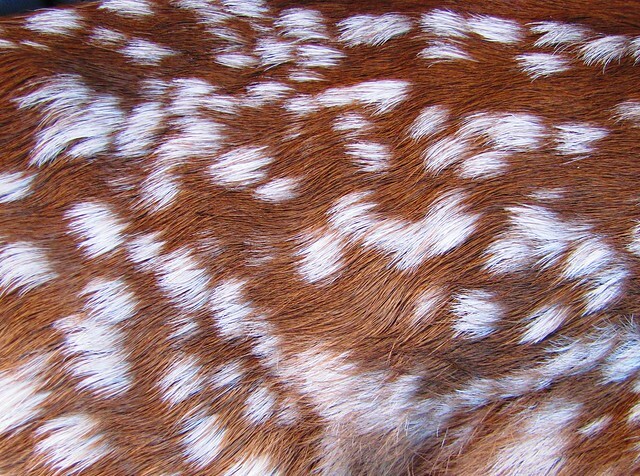 The spot pattern is beautiful, the tiny hooves precise, and the blue eyes becoming. Hearing the complete story, I decided that a quick return would be the only option here. There was nothing wrong with this deerlet other than the fact it was a deer. 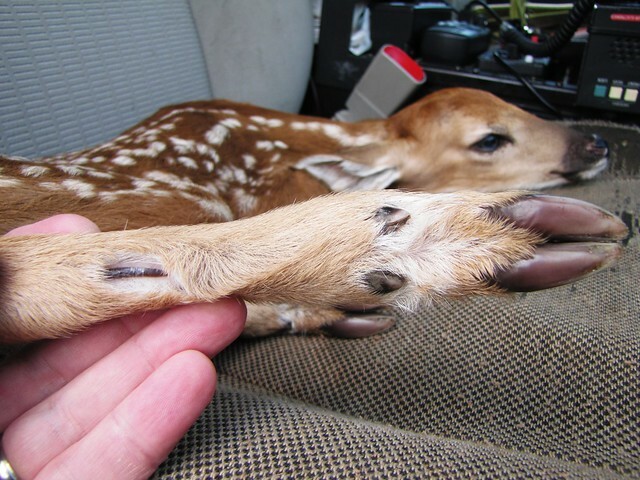 Kathy asked about a cut on the fawn’s back leg (see below) and I gave it a look see. This apparent cut was actually a gland. It appears as a darkened tuft of hair on the hock of adult deer and serves as one of many scent glands on these smelly beasts. I was able to show her the identical gland on the other foot. This gland was non-functional as of yet. 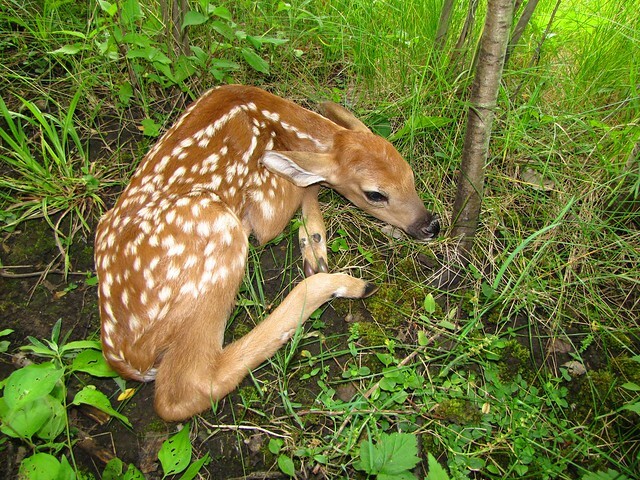 With the frozen fawn on my lap we rode back to its point of origin, I walked it back into the brush, and “dropped” her gently back into position. Like a trusting sack of potatoes, the blue-eyed creature never moved a muscle during the entire trip. In all, this fawn was frozen for at least a half hour. I can only assume that it thawed soon after we left. We never saw “mom” but I am confident that she was nearby and that she returned to her pseudo-orphan and spirited it off to a better hiding location. Since fawns around here rarely come in singles, her wiser twin sister/brother was probably nearby. The next time I see this individual she will probably be brown-eyed and un-cute. We can only hope that the adult version does not attempt to re-enact its patrol car ride in Officer Kathy’s vehicle. How Many Turtles Can Sit on a Log? depends on the log -not the turtle. It was upon the occasion of a recent bird walk that I stumbled across an unusual site. In theory, one should be looking up during such an activity but my eye was drawn to an impressive sight down at the water level. The subjects were reptilian and not avian in nature. I guess I was breaking a few birding rules in this process, but because I was leading the hike at the time this kind of thing didn’t matter. I was looking at a bunch of turtles on a log. 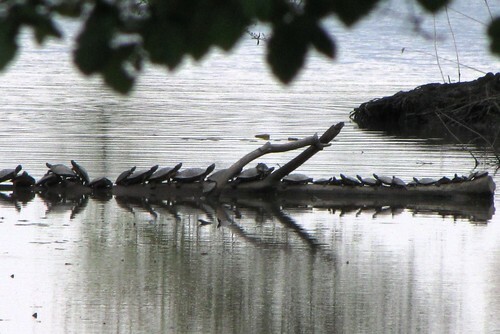 In most circumstances, the sight of turtles sunning on a log doesn’t merit more than a glance. 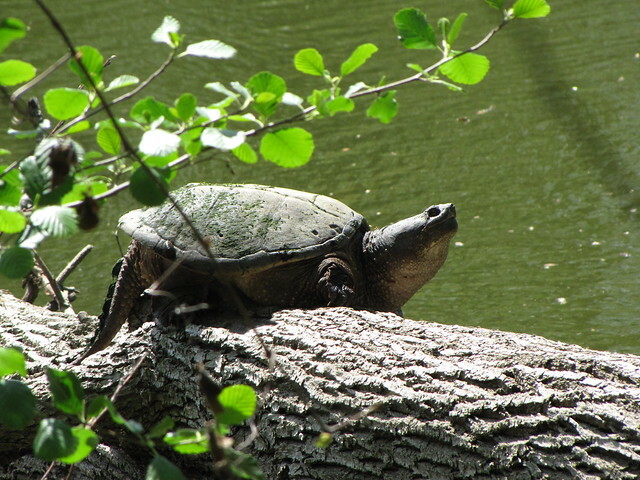 To date, probably the most impressive “turtle on log” sightings involved a lone map turtle perched high above the water on an exposed root like a high dive act and a snapping turtle in a tree. Up until this year I had never seen a Snapping Turtle actually sunning itself. Last month I saw a sizable Snapper that had hauled itself well up onto the trunk of a fallen tree (see photo below). It took a header and dropped like boulder as I approached. Getting back to the present case, however, it was a matter of sheer quantity that prompted my gawking factor. The morning sun was just peeking through the trees on the opposite bank of the Detroit River. The exposed (above water) portion of the tree limb was probably only about ten feet long. 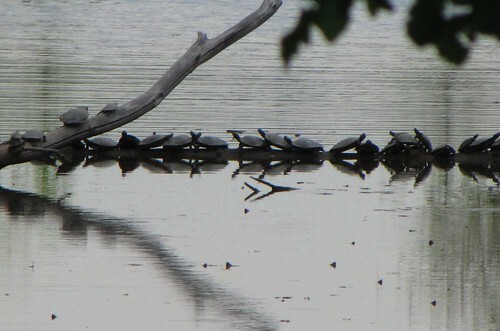 There were no fewer than 41 turtles positioned along that length– a figure determined after the fact through intense photo analysis (1 turtle, 2 turtle, 3 turtle, four…). I’m sure this is not a record by any stretch but it was a personal record. The turtles were Map Turtles (as indicated by their high ridged shell) and they are famous for such communal sunning feats. They will often stack up on each other two or three high. Only a few of these turtles were actually stacked and I have the feeling that this gang wasn’t finished yet. You’ll note at least a dozen more little heads sticking up in the surrounding water. These were turtles waiting in line to gain access to the log (which was apparently the only parking lot for miles around!). Apart from the numbers, the arrangement of this crowd was amazing. Again I refer you to the picture. These two shots overlap by about eight turtles. Nearly the entire contingent of little map turtles were on the right side (see top picture). They were facing left. Most of the big map turtles were on the left side and they were equally divided into left facing and right facing pose (see bottom picture). The only remaining space was upon the shell of the bigger turtles and a few of the little guys were beginning to stack upon the big ones. Who knows how many would have eventually covered the log? Unfortunately, I had to go look for birds and we will never know the answer.